With Shunenacdie Sam's prediction for an early spring, the spring fever is alive and well. Living in zone 6a, we had a tease of spring last week and all the snow melted away. Our spring bulbs that have been trying to come out since December, once again got shut down with 15 cms of snow earlier this week. Given the unpredictable winter we are having, I'm impressed with the tenacity of our spring bulbs. A big chunk of them were just added this autumn, and proving just how adaptable they are. Before the snowfall, I checked the garlic beds and was happy to see some life! 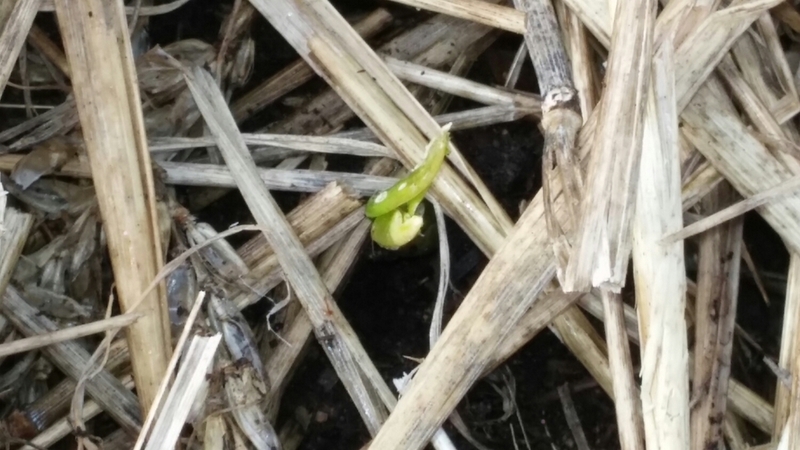 The first signs of life for our 2016 garlic crop. Inside, I have been testing saved seeds for germination rates. To date all are great except the cucumber don't see to be doing so well but they could just be shy! This week eastern columbine, red zinnia, French marigold and zinnia from saved seed were sowed. We have dill,romaine and a few tomatoes now making their first true leaves. Also, 200 red wigglers moved into a soil turned worm bin to help to close our loop and reduce our overall carbon footprint. As the last of our seed orders arrive we are excited to have more seedlings around and once the snow is gone to sow early outdoor crops.